She has just wrapped up her Las Vegas residency after performing 122 show. 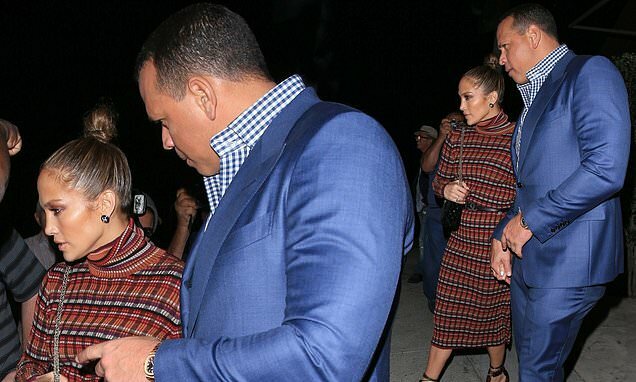 And Jennifer Lopez appeared to be revelling in her new-found free time as she enjoyed a romantic dinner date with her boyfriend Alex Rodriguez in Los Angeles on Saturday night. The singer, 45, dressed her famous curves in a knitted checkered midi dress for her evening out with her 43-year-old former baseball player. Jennifer looked effortlessly sophisticated in the burgundy dress, which flashed a hint of her toned legs with its knee-length hemline. Cinching in her slim waist with a black Chanel belt, the Love Don't Cost A Thing hitmaker added a boost to her frame with orange and black heels and accessorised the look with a black shoulder bag and stud earrings. The songstress slicked her brunette hair back into a high bun and accentuated her signature JLo glow with a bronzed make-up look and slick of pink lipstick.